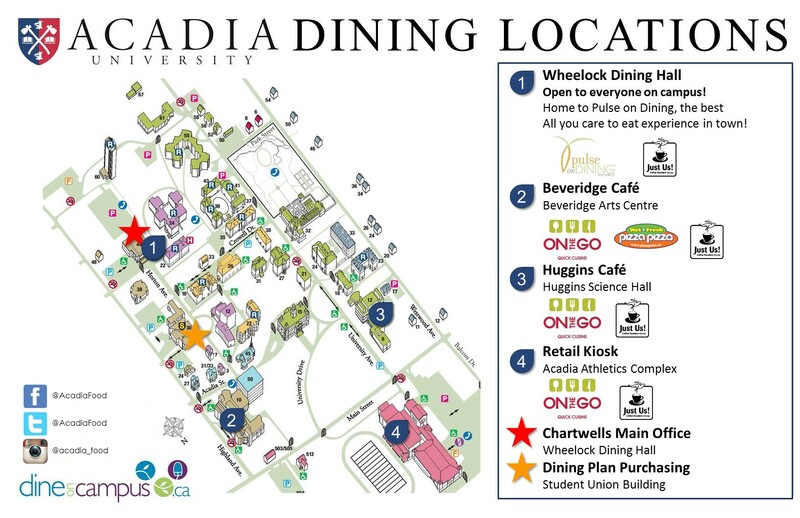 Residential students at Acadia University, you are required to choose a meal plan for Wheelock Dining Hall. Use our Pulse on Dining program to its full potential by eating all of your breakfasts, lunches, suppers and snacks in the dining hall. With so much variety, you'll never go hungry! 1. Pick a plan that suits your needs. Choose the 7 Day Max Plan for the most benefits (unlimited dining hall access and $650 tax free dining dollars to use at the BAC, Huggins and Athletics Complex Cafés). 2. Swipe into Wheelock Dining Hall as many times as you like. Use your tax free dining dollars for a snack and coffee at our retail cafes. 4. All plans expire April 2019. Residential meal plans are incorporated into your student fees and therefore selected and purchased through Residence Life. Dining plans are not fully refundable and can only be cancelled if you elect to withdraw from residence. If you withdraw from residence, your refund will be pro-rated based on the date you move out. Please see the Residence Withdrawal Policy for more details. DO YOU HAVE ALLERGIES OR DIETARY NEEDS? Chartwells is happy to be here to support and help you identify safes foods! If you have food allergies, please identify yourself to one of our staff members. Or you may fill out our Allergy Form in order to help us better prepare for your needs. Once the form is completed please email it to Becky Kennedy, Residential Dining Manager, at becky.kennedy@acadiau.ca. If you have any further questions or require assistance you may contact Becky at (902) 542-3049. Buy the freedom you want. Purchase the 7 Day Max Plan for unlimited entries into Wheelock Dining Hall from September to April PLUS use your Dining Dollars for tax free purchases at the BAC, Huggins and Athletics Complex cafés. Unlimited dining for $19.61/day all year! It's the best deal in town! Don't miss the opportunity to celebrate a special occasion. Say it with a student gift package. Top-up Axe Cash at any time so you always have money for that morning coffee or afternoon treat! Living a healthy lifestyle helps with your studying! This includes making informed, healthful dining choices. Click below for more study skills brought to you by AcadiaU.ca! Wondering when the next fun foodie event is happening at Wheelock? Like us on Facebook to stay updated!